The UCLA Center for Jewish Studies and the UCLA/Mellon Program on the Holocaust in American and Would Culture sponsored a very interesting program on campus that featured four panels and a keynote speaker, February 7 and 8. 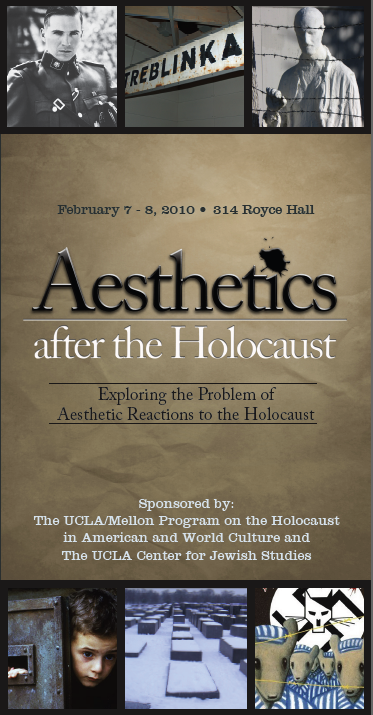 The symposium was titled “Aesthetics after the Holocaust” and attendance was free. VOG attended the fourth and final panel on Monday afternoon which referenced the previous panels. The speakers for this panel were highly qualified researchers and commentators from the University of Wisconsin and Columbia University. What does the phrase “Holocaust aesthetics” mean? The first speaker at the panel we attended related various accounts of important questions that generated lively and divisive debate during activities that preceded the 1993 creation of the National Holocaust Museum in Washington DC. One of the most interesting stories (judging by audience interest) concerned whether to display a “bale of hair” recovered at Auschwitz. What was the trade off in terms of revealing a horror versus creating a sensation? The eventual decision, which followed extended discussion over months and powerful emotion stands, was to present a photograph of the artifact. That decision kicked another round of discussion as to the aesthetic effect of presenting a photograph versus keeping the artifact out of the display completely. Aesthetics refers to the power of artifacts to create emotion and capably describe something. Aesthetics are extremely important when trying to explain or articulate a horror like the Holocaust because the dimensions of taste, pain and witness are very difficult to define. The second speaker discussed how a historical horror such as any holocaust necessarily changes the nature of the most ordinary and private records turning them into something public with new meaning and purpose. She described how family photo albums from the more modern era were being recreated by individuals and posted on websites in an attempt to identify what became of loved ones. The event was the use of poison gas against the Kurdish nation in the 1990s by Saddam Hussein. One of her many points was how the Internet medium changes the meaningfulness of something like a family photo album, losing its tactile power in exchange for reaching a much wider audience that would otherwise have little if any interest in the photos of a given Kurdish family. Until that family disappeared and a survivor sought to learn what happened and if there were survivors. The advent of present day social media such as Facebook and Twitter as forms of casting a wide net while creating a family narrative was touched on. VOG is very interested in themes mentioned but not discussed in the panel we attended. The brochure expressed our interest with how the Second and third Generations surely have their own “modes of witnessing” that result in a new aesthetics that trigger and cue memories. These triggers and cues will certainly be represented in new media and technology. Just as the First Generation has been faced with how to address the aesthetics of post-Holocaust representations (the reference is to the late 20th century growth and establishment of Holocaust museums) so will the Second and Third Generations be faced with how address similar questions over the Web; an area in which VOG intends to be an important of creating.